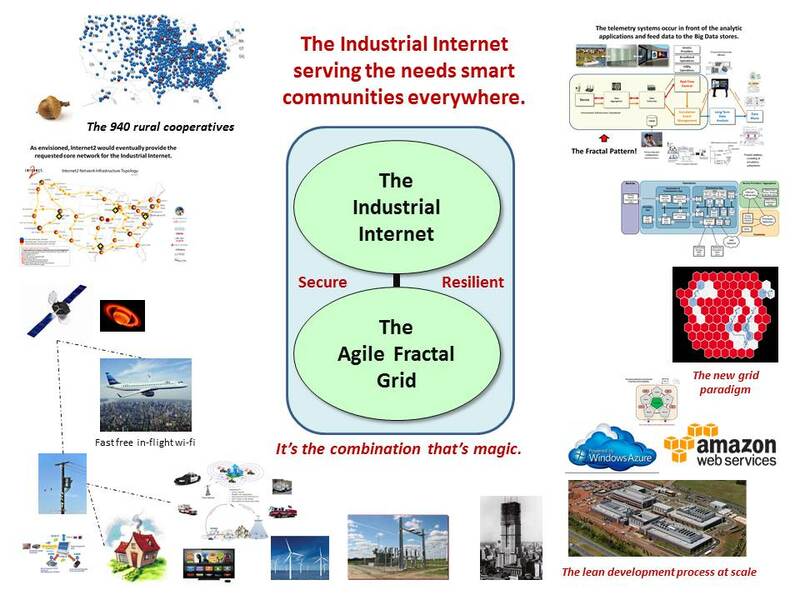 The Agile Fractal Grid is a combination of the Industrial Internet operating in tandem high performance computing and a new generation of digital controls that can operate the grid with greater agility, real time precision, and dynamic alignment with changing local conditions. The concept is that new grid technologies coupled with a trustworthy industrial internet can translate distributed generation, better knowledge of state, and more extensive and refined control technology into more efficient operation of the grid under normal conditions, and a better, quicker, more nuanced reaction to fault conditions to accelerate restoration, and provide better service until power is restored. Agile control rests on the rapid and accurate collection and sharing of information at all levels of grid operation, and the integration of advanced analytics to manage the data and assess control options. The foundations are a communications network that you can trust (the Industrial internet), and a fractal architecture on which each fragment of the grid operates like a complete grid, using an information and control paradigm that can be shared with other fragments to allow coordinated operation, islanding, and reintegration. The grid is changing from a relatively uncontrolled entity in which large scale power generation “regulated” voltage, phase, angle and power flow through its immense capacity to one where local generation and controllable loads are providing a smaller scale, more efficient option, but one which must be actively controlled. The Agile Fractal Grid concept shows how this can be accomplished at all scales from a factory to a continent. The community of practice assembled to deliver on this vision will learn from other subject matter experts while teaching these methods to others in the spirit of the timeless way of building. Our community of practice will use lean development and other operating principles that have met these challenges in the past while speeding innovation to markets.